Things we do and make and see. Episode 100: Our First Live Show! 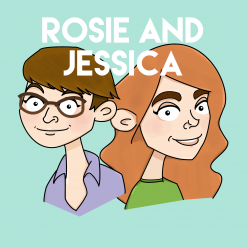 In episode 100, Rosie and Jessica take to the stage for their first ever live show! Recorded live in London on August 6th 2017, Rosie and Jessica catch you up on the Young Adult Literature Conference and sleepovers before revisiting their first ever Top 5 with their favourite films of the last five years. Plus an audience Q&A! Jessica picked Come On Eileen by Save Ferris, while Rosie went for I’ve Just Seen a Face by The Beatles. Playlists of all our song choices are available on Spotify! Here are Jessica‘s and Rosie‘s. Support Your Local Podcast! Become a Patron!